Let it snow...in Florida? It's Snowing in Celebration! Let It Snow…in Florida? It’s Snowing In Celebration! If you’ve ever been to Florida, you know snow is not a usual occurrence. From December 1 through December 31 though, you’ll be able to see snow in the Disney-area town of Celebration, Florida! The snow (made of foam, no cold here!) begins each evening at 6 p.m., but that’s not the only fun to be had in this makeshift winter wonderland. A small ice-rink is set up in the middle of the downtown Celebration area, and kids can skate to their hearts desire for just $10. The family can also ride the Celebration Express, a mocked-up “train” that takes a little trip around town and costs $5. Santa is also available for pictures, and the family can even take a ride in a horse-drawn carriages for just $5. 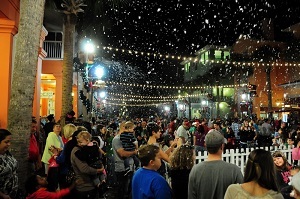 There may not be real snow in Florida, but the town of Celebration is doing it’s best this holiday season to bring a little winter magic to our warmer climates! Have you ever seen the snow in Celebration? How was it?